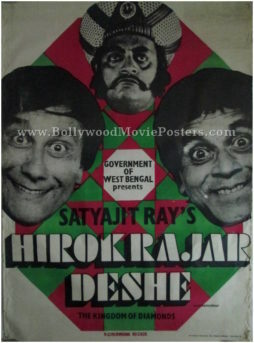 Extremely rare vintage Satyajit Ray movie poster of one of the finest films ever made in Bengali cinema, Kapurush O Mahapurush (1965) for sale. Written and directed by master filmmaker Satyajit Ray, Kapurush O Mahapurush is a compilation of two separate short films based on two short stories “Janaiko Kapuruser Kahini” by Premendra Mitra (The Coward) and “Birinchibaba” by Parasuram (The Holy Man). Music for the film Kapurush O Mahapurush was composed by Satyajit Ray himself. 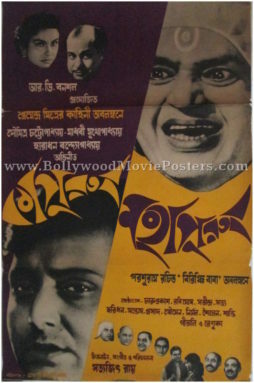 Kapurush O Mahapurush is believed to be Satyajit Ray’s first Bengali film to be dubbed and released in Hindi, making this rare Satyajit Ray movie poster highly collectible! The critical acclaim and success of the two short films led the Academy Film Archive to preserve both Kapurush and Mahapurush in 2005.